It’s important to flush a water heater tank periodically to so the water heater will heat efficiently and produce ample hot water. 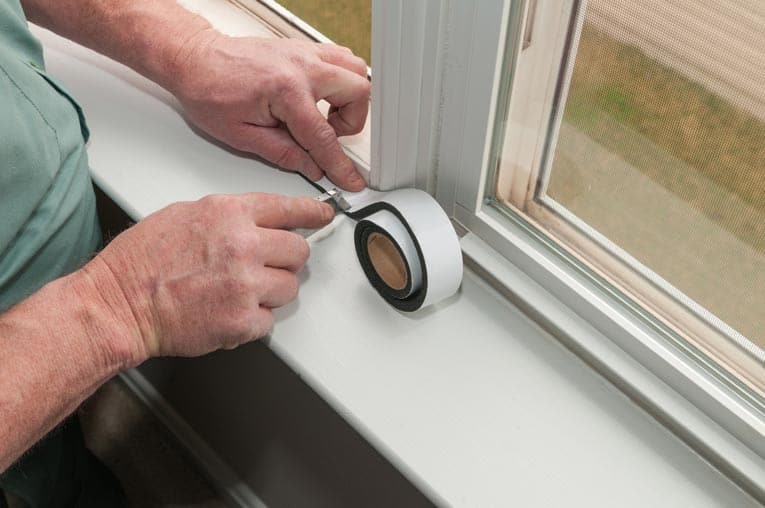 Save money and time by handling this project yourself. Plan to do it once every two years. Why is this necessary? Over time, mineral deposits collect at the base of a water heater tank. These deposits can build up to a very thick, crusty coating. This coating diminishes the transfer of heat from the burner to the water in the tank. Eventually, it also causes corrosion. Additionally, deposits can break free, clogging faucets, pipes, and the valve that is used to flush or empty the water heater tank. 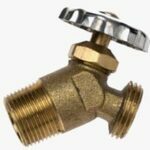 The drain valve at the bottom of a water heater, which looks like a small outdoor faucet, is used for flushing mineral deposits from the water heater or emptying water from the tank for replacement or repairs. When using this valve, remember that the water is hot! Flush 3 to 4 gallons, then close the valve. For more detail about these steps, please continue. 1 Turn off the water heater’s gas valve or electrical power, depending on whether it is a gas or electric heater. 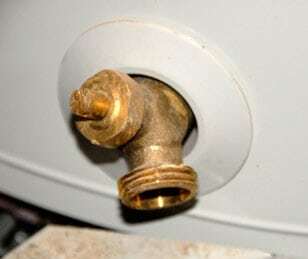 To drain a water heater, first attach a hose to the drain valve. 2 Turn off the water inlet valve that controls the supply of water to the tank. 3 Attach a hose to the drain valve at the bottom of the water heater, and run the hose to a drain, to the outdoors, or to a large bucket. Make sure the end of the hose is below the level of the drain valve. 4 Open a hot water faucet somewhere in the house or the water heater’s pressure-release valve to let in air so the water heater can drain. Caution: Remember that the water exiting the water heater will be very hot! Be very careful to prevent scalding. If you want to be extra safe, allow the water heater to cool for many hours before doing the next step. 5 Open the water heater’s drain valve. If you’re just flushing sediment, allow 3 or 4 gallons to exit until the water from the drain valve runs clear. Again, beware of hot water! 6 Close the drain valve. Then turn the water supply valve back on to fill the tank, and turn the gas valve or electricity back on (relight the pilot or electronic ignition if applicable). If your water heater won’t drain when you open the drain valve, try opening the pressure-relief valve—this may break the vacuum that prevents the water from escaping. It’s a likely possibility that the drain valve may not be working because it is clogged with mineral deposits. A working drain valve at the base of the tank empties a water heater. Sometimes the water heater’s drain valve won’t work or barely dribbles when you try to use it. Sometimes the drain valve is defective, but most of the time it’s clogged. Mineral deposits, which accumulate over time, consist of lime scale, calcium, and iron in the water. If excessive deposits are allowed to build up inside the tank, they can clog the drain valve when you try to use it. 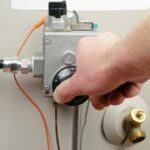 1 Depending upon whether the water heater is gas or electric, turn off the gas valve or circuit breaker that powers it. 2 Connect a hose to the drain valve and run it outside, placing the end of the hose below the level of the water heater. Turn on a hot water faucet somewhere in the house or open the water heater’s pressure-relief valve to break the vacuum inside the tank. 3 Then open the drain valve. If the water runs freely, the valve works. If it doesn’t, it’s probably clogged. 4 If you suspect that the drain valve is clogged, you can try repeatedly stepping on the hose a couple of feet away from the tank to squirt water and air bubbles back into the tank. Hopefully this will break loose the clog. 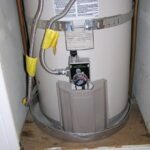 If it doesn’t, please see How to Back-Flush a Water Heater.